As a blogger, I received invitations from different locations in the Philippines for a blog opportunity. I do not normally ask for anything in return for my blog. I travel around the Philippines because I want to explore the beauty of my country. But last April 2014, I received an invite from the owner of Dona Choleng in Cagbalete Island. I was delighted by the fact that I really wanted to go back to the island since my last trip in the island was good only for 3 hours, more or less. Without hesitation, I accepted the offer and I promised that I will blog their resort in exchange for the invite and accommodation. After one year, I was back in Cagbalete Island. But this time I was not alone! Mark Christian Apordo, Bok (my guide - 0999 905 8490) and Joy Que were with me to share the adventure in Cagbalete Island. Mauban is 147 kilometers from Manila and 40 kilometers from Lucena City. It is accessible by bus and other modes of transportation. Go to JAC Liner bus terminal at Kamias, Quezon City. The first bus leaves at 5 am. The afternoon bus leaves at 1 pm. Travel time is more or less 5 hours. From Mauban, JAC Liner leaves at 4 am and 2 pm en route to Kamias Bus Terminal and 4:30 am to Buendia Terminal. Go to Buendia-LRT Taft station. There are several buses servicing the route to Lucena Grand Terminal such as JAM Liner, DLTB, and JAC Liner. As early as 4 am, they offer the trip to Lucena. Last trip going to Lucena is around 9 pm. Board a bus going to Lucena. Fare from Buendia to Lucena Grand Central Terminal is P209.50 (127 kilometers). Travel time is 4-5 hours from Buendia. Once you reach Lucena Grand Terminal, board the NCR Bus to Mauban. First trip is 4:30 am, then followed by 5:10 am and so on. Every 40 minutes, the NCR bus leaves. Travel time is 1.5 hours and fare is P54. Last trip going to Mauban is 5:30 pm. Airconditioned vans are also available at SM City Lucena and Metro Gaisano Lucena City Van Terminals from 10 am to 9 pm. Fare is P70. Arriving in Mauban, go to the Pantalan (port) at Barangay Sadsaran and board the boat to Cagbalete Island. Fare ride using the trike to the port is only P10. You can also contribute to their economy by paying the Environmental fee at the Tourism office for only P50. There are only 2 schedules of the public boat transportation from Mauban to Cagbalete island – 10:00 am and 3:00 pm (from Cagbalete to Mauban – 7 am and 1 pm). Travel time is 45 minutes only and the fare is P50. It is better to arrive at the port early. During lean season, the boat leaves 10:30 but during peak season, it leaves 9:30 am. However, that during the influx of tourists (most often during Saturdays, holidays and summer season), the coast guard allows passenger boats to sail in varying times. Maximum capacity of the boat is 50 passengers only. Again, try to go to the port early or else you might miss your ride to the island. In case you miss the 10 am ride, wait for the 3:30 ride or you can charter a boat for P1,000 to go to the island. Leaving the port, you can look back at the town of Mauban and wonder at the scenery. But I did not use public transport that day. 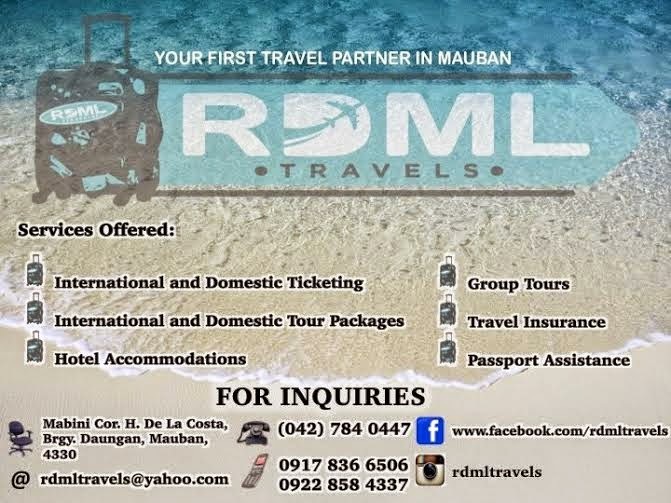 Thanks to RDML Travels (Contact persons: Randell Dy 0917 836 6506, 0998 995 7876, 0922 858 4337 and Mae Llamas, 0917 821 2796), we were given our private transport to the island after an island hoping tour. Dona Choleng Resort is the premiere resort, the best resort that provides the best accommodation in the island and I was about to experience that famed reputation. It is tagged as the Boracay of the Pacific! Normally, the entrance of Dona Choleng is on the opposite side but since I was given private transport by RDML Travels, I landed or entered through the beachfront entrance. They offer the best accommodation in the island! Not only is the accommodation the best but their recreational facilities are also the top of the line! From the resort, you have to go back to the docking are and witness the sunset. Best spot to enjoy the sunset is in Greenview Beach Resort (see map). If you are a nature lover, you will definitely enjoy, love, and be taken away by its sunset! If Greenview Beach Resort offers the best sunset view, Dona Choleng offers the best sunrise view in the island! After a very sumptuous dinner and a bit of drinking spree, we woke up early, took an early breakfast for our adventure slated on the day. After watching the sunrise in Cagbalete Island, we went to Yang-In to see and enjoy the sand ripples! But this time our mode of transportation was the the floating bamboo raft (balsa). Again, this was part of the tour provided by RDML Travels. Good thing we were accommodated by RDML Travels! We stayed in Yang-In for an hour and then went back to Dona Choleng. It was already low tide when we we arrived at the beachfront of Dona Choleng. We checked out and expressed our sincerest gratitude for the pleasant, warm and unforgettable stay in the resort. Truly, the best accommodation in the island. Enjoy your stay at DONA CHOLENG! Jun, you are doing great. Your blog post really interesting and very informative. I admired you for your reviews about the resorts in Cagbalete Island. Honestly, I never heard about the island until I found your post. The Philippines resorts has a lot of charming resort to offer and need to explore for our local guest and foreign tourists around the world. Good job. Sir Jun, if magtent kunwari kami, is there any access to bathrooms or CRs? We are planning to go there last week of Dec this month. pwede po ba dito mag rent lang ng tent kahit 2days and 1night? sir how much po rent nila s tents? salamat.